I'm making a Thinking of You greeting card and I'm having some trouble putting it together. I'm terrible with color schemes and I want this card to be different from the usual 5 x 7 fold-the-paper-in-half type of card. I have included a picture of the focal point of the card (though it's not in the size I plan to use it with). Any advice you could give me on a background color and other ways to make it pop would be great. Thanks! Thank you, Rebecca, for contacting us. The good news is that you already have a color scheme for your card. How? In truth, the greeting card art/theme you have is not just a sketch or a scribble, but it is fully complete with color. So use colors from that picture you posted to match the rest of the card. This means you can use either the light or dark colors from the art for the background of the card. In truth, darker colors are cooler because such cards are less common. However, normal writing materials are not usually legible on such dark colors (which is why such cards are less common). To solve this, either (1) use special opaque light colored pens to write on the dark background or (2) cut out and glue a smaller piece of light colored paper inside the card to use with your normal writing materials. Now, before delving into creative options for the card, it’s important to point out that greeting card creativity comes in all shapes, styles and sizes. Hence, there’s nothing wrong with the “usual 5 x 7 fold-the-paper-in-half type of card” you mentioned because it’s the thought that counts. This also means that there’s nothing wrong with looking into “other ways to make it pop” like you want to. So, let’s do that too! A simple way to make the card stand out is to use ribbons on the card. You can tie a bow (or a couple bows) and glue it on the top left corner of the card. 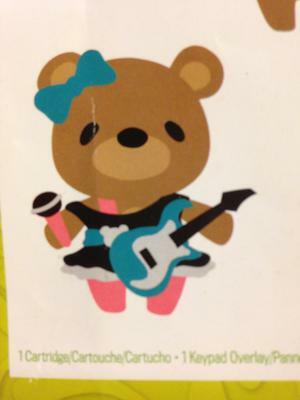 This could even match the bow on the bear's ear if you like. Alternatively, use a hole-punch to create an opening at that corner and tie the ribbon through there. If using the hole-punch method, then remember to give the ribbon enough slack so that the card can still open up and close up freely. You could take this a little further and totally sever the folded edge so that the card becomes two separate pieces without a seam. Then create three holes each for the ribbons to pass through (like a three ring binder). With this method, you probably want the ribbons to be tight, not slack, and remember to use hole protectors on the openings to prevent the holes from tearing as you open and close the card. Even though these are three separate creative examples, nothing stops you from doing a combination of the three if you like. Does this help? If not, please feel free to ask more questions. Also, don’t forget to post a picture of your finished work so that we can appreciate your card.